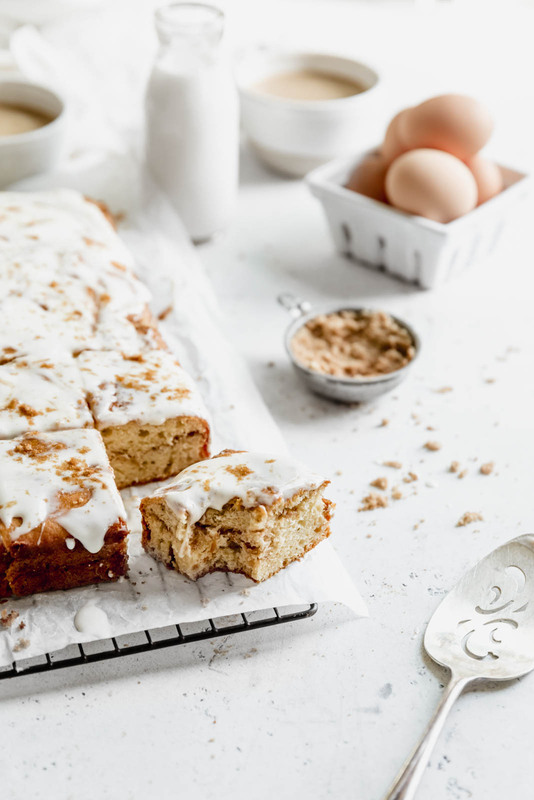 3 words: cinnamon roll cake. I’m 11 years old, at the mall leaving The Limited Too with my mom. She just bought me the coolest bedazzled dress and glitter flared jeans (which I will wear together obvi). We’re walking towards Macy’s when the enticing scent of fresh baked Cinnabon wafts over. I have to have one. So I beg my mom. My mom is the BEST, so the two of us get one for dinner. The perfect day: a new outfit for my 6th grade dance and a Cinnabon–truly is there anything better than this? Now, fast forward 10 years, same me, same sweet tooth and I have a serious hankering for a cinnamon roll with no Cinnabon in walking distance. A tragedy. I could make cinnamon rolls, but do you even know how LONG it takes to make a homemade cinnamon roll?! It takes hours–nay days–of premeditated thought and I’m the girl trying to bring her butter to room temperature in the microwave 30 seconds before I make cookies so you know that’s not my style. Not to worry, friends. 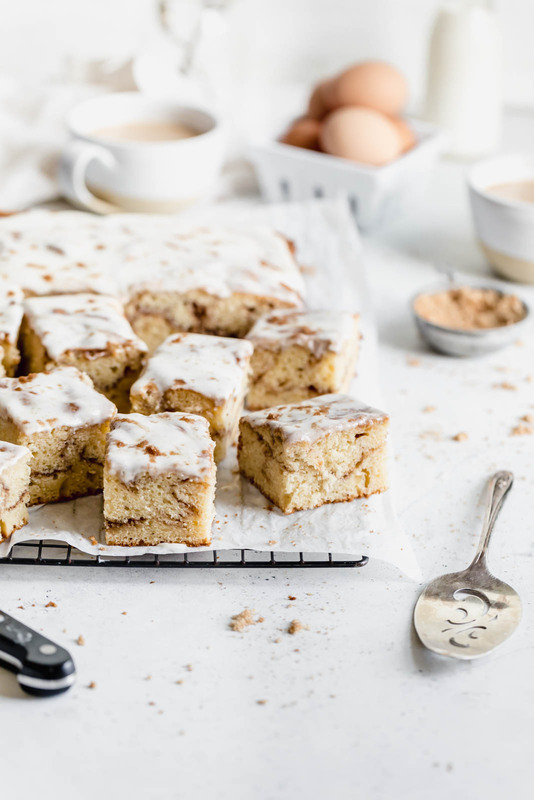 I am here to the rescue with this cinnamon roll sheet cake that packs all the punch of a Cinnabon in under 2 hours. 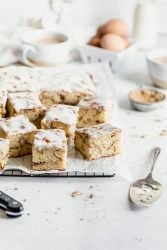 A tender buttery crumb cake, just dense enough, with huge swirls of cinnamon sugar and a tangy cream cheese glaze come together to make this drool worthy sheet cake. How to get that defined cinnamon swirl? Spoon half the batter into a 9 by 13 sheet pan. Sprinkle a thick layer of cinnamon sugar, covering all of the batter. Spoon the remaining batter over the cinnamon layer, spreading to the edges the best you can. Sprinkle the remaining mixture on the top layer in concentrated areas. Using a butter knife make BIG swirls in the batter. I was an art major and this is about as close to painting as I’m getting these days. Have fun with it, you’re about to smother it in cream cheese frosting anyway. 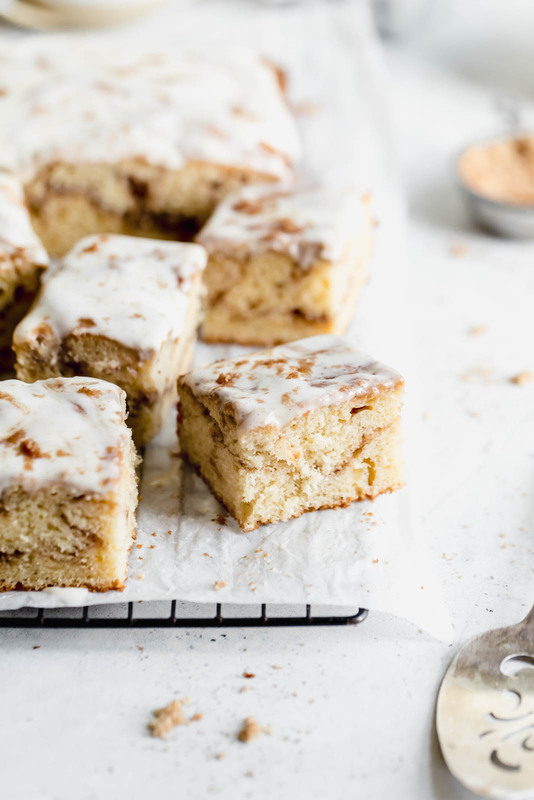 The tangy cream cheese is the perfect creamy complement to this cinnamon masterpiece. It’s just sweet enough and lick your fingers good. This recipe makes a lot of glaze, but, like, the frosting is the best part (we can fight it out in the comments if you disagree). 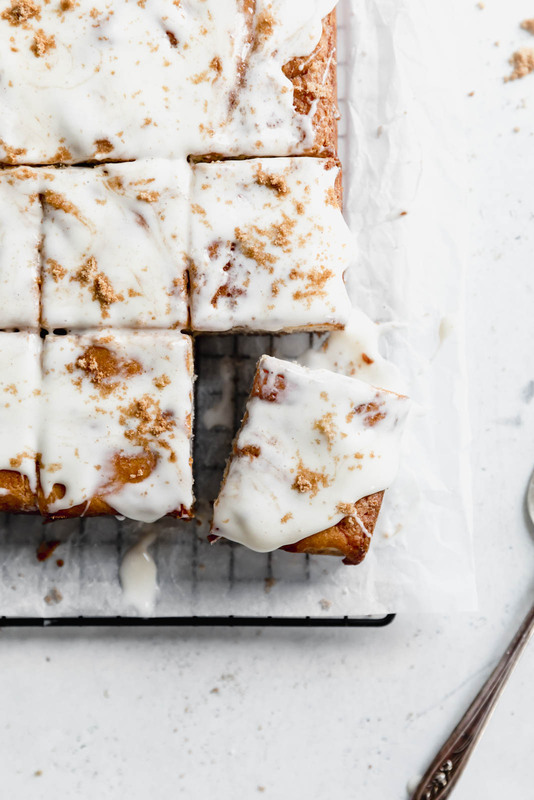 Slather that frosting alllll over and you’ve got yourself an easy sheet cake that’s just about as good a new outfit from The Limited Too and a warm Cinnabon. 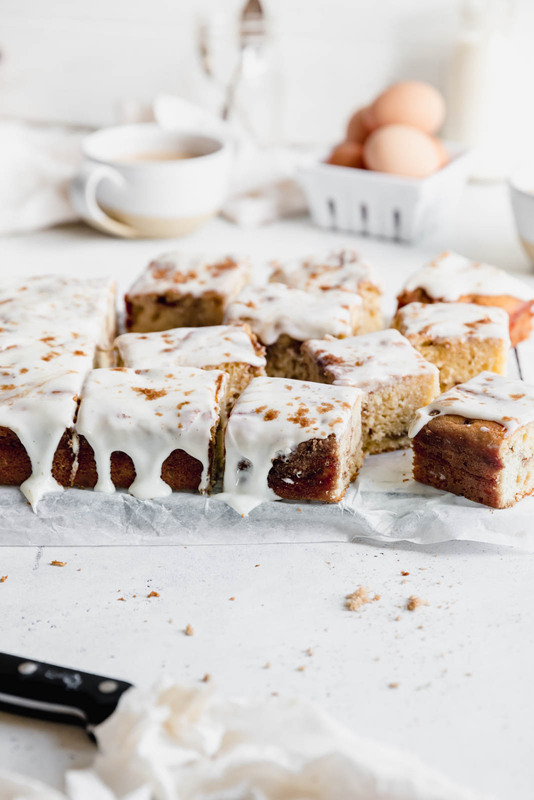 Buttery sheet cake swirled with ribbons of cinnamon and topped with a cream cheese glaze. 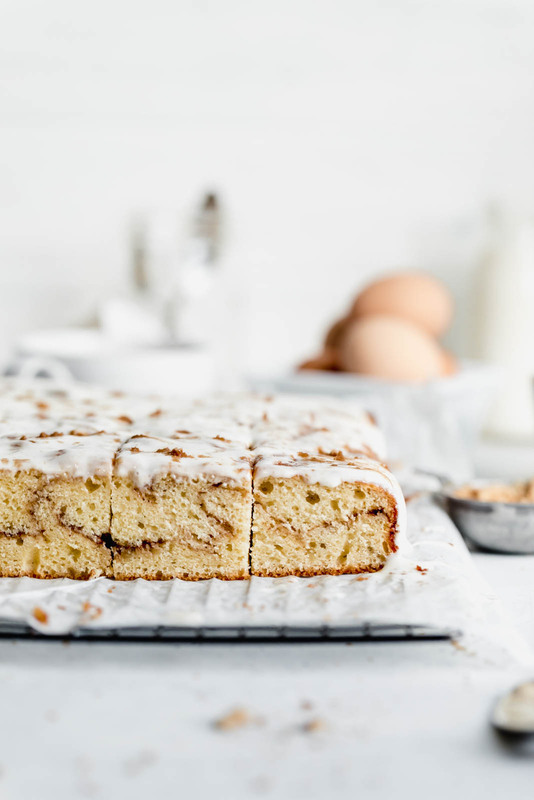 This cinnamon roll cake has all the decadence of a Cinnabon cinnamon roll in half the time. Preheat oven to 350o F. Line a 9 x 13 inch sheet pan with parchment paper on the bottom and grease the sides. In a large bowl beat the softened butter, granulated sugar and 1/3 cup of the brown sugar together until light and fluffy. add in the eggs and vanilla extract. In a separate bowl, combine the flour, baking powder, baking soda and salt, whisking to combine. Slowly alternate folding in the flour mixture and the yogurt into the wet ingredients until everything is combined. Take the remaining 2/3 cup of brown sugar and mix with the cinnamon. Set aside. Pour half the batter into the pan, then sprinkle with 1/3 cup of the cinnamon sugar mixture, leaving the last 1/3 for the top. Spoon the remaining batter over the first layer, using an offset spatula to even it out. Sprinkle the remaining cinnamon sugar over the batter. Using a knife create cinnamon swirls on the top half of the batter. Bake for 45 minutes or until the cake is a golden brown and a knife inserted into the middle comes out clean. Allow to cool before removing from pan. While the cake cools make the glaze. Combine the softened cream cheese, powdered sugar, vanilla extract, salt, and milk in a large bowl, beating until smooth. Just one cup flour? Want to double check before getting started on this brutal cold day! Should be 3 cups. Thanks for catching that! I will definitely be making this!! Thank you for the recipe, Sarah! Hi- Do you really need just 1 cup of flour? Thanks, would love to make this….. Perfect treat. Love the sheetcakeversion. List calls for baking soda. Directions call for salt. SO GOOD. Thank you for your kind words! Thank you! Thats so sweet. WAW. Have to try! Because yes, why do cinnamon buns take so long, WHY? RIGHT?! Like who has the patience? Hi, Sarah! Just wondering if this cake keeps well (at room temp? in the fridge?) & if so, for how long? Would love to be able to make it ahead of time if possible, Thanks! And for those of us older sugar to belly fat avoiders of sugar I will substitute a no calorie sweetner (Splenda, Stevia Sweet Leaf etc. and to make the brown sugar by adding a bit of dark mollasses mixed in with the sweetener. And I prefer whole wheat flour to white and often will substitute part of the flour (25% or so) with Oat Bran that is also available as Gluten free. Us old folks try to snack healthy when we can. Uhm, yeah – you had my attention immediately. 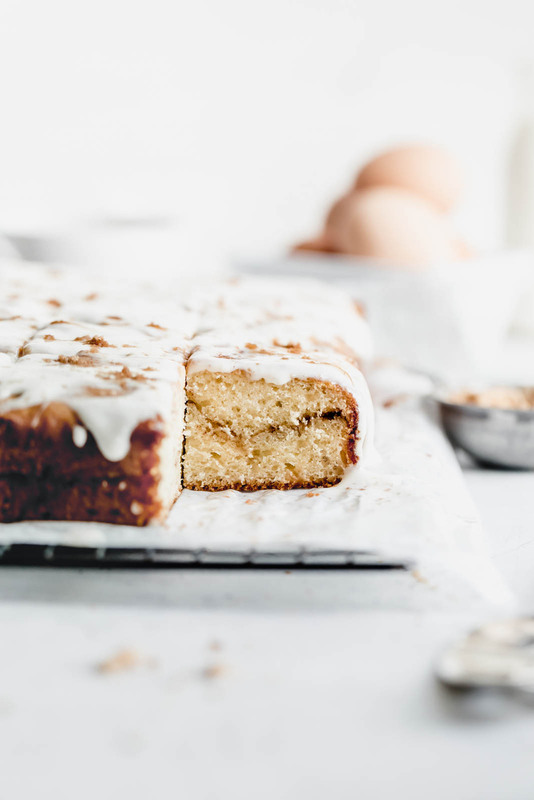 Cinnamon rolls + cake are two of my favorite sweets and this recipe is absolutely genius! I seriously cannot wait to make this! Hello, is there salt in the glaze. Salt is mentioned in the instructions but not in the ingredient list. Thank you. Hey Lynn! I usually put a little salt in the frosting but just a pinch! I’ll add that into the ingredient list right away! Hi, Sarah! This cake looks delicious! Do you know if it keeps well at room temperature, and if so, for how long? I’m wondering if it’s possible to make it ahead of time, or if it’s best served as soon as it’s made. I would recommend serving as soon as possible, but you could definitely make it a day in advance. Great! Yes, this helps a lot! Thanks so much, Sarah! Can we substitute sour cream for the yogurt? 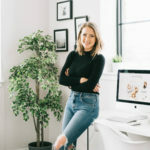 P.S big fan of your beautiful blog. So sweet of you–thank you! 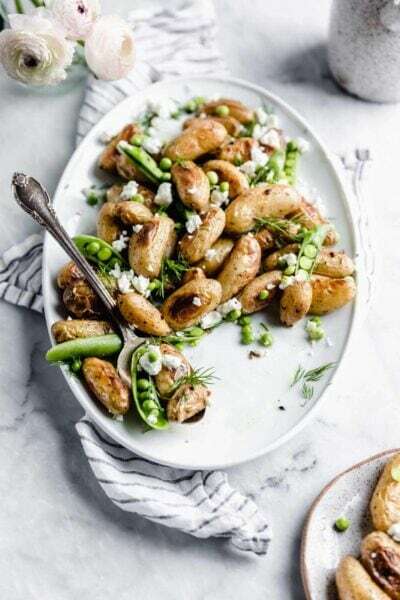 You definitely can–I find that the acid in greek yogurt makes for a beautiful rise, but sour cream should do the trick too. If anything the cake will be even moister! Love, love warm homemade cinnamon rolls, and they are SO easy to make ahead, let rise in fridge and bake for breakfast. BUT this cake looks like a yummy coffee cake! NOTHING compares to a warm cinnamon roll–I totally agree. Nice blog about cinnamon roll cake. 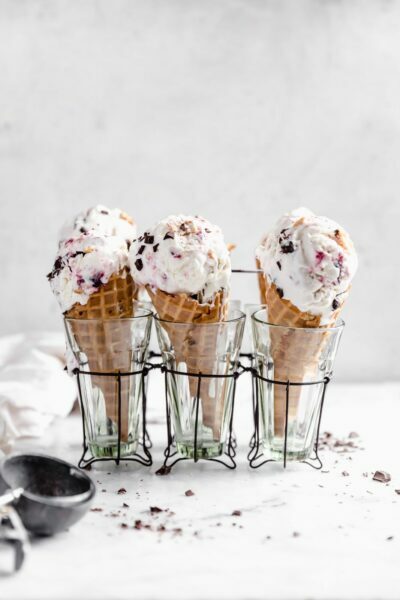 If one wants to learn more about bakery, Whitecaps International School Of Pastry provides one of the best baking and pastry courses in Bangalore. They have both short term and long term course durations. The batter is definitely a sticky one! It helped us to take a rubber spatula coated in cooking spray to smooth it out. The 9×13 sheet pan has 2” sides ? I have a 9×13 sheet pan but it has less than an inch deep sides, or a 9x 13 casserole glass dish. Will the cake be ok baked in casserole dish? Is plain flour (UK) a good substitute for all purpose flour? We don’t have all purpose flour here (that I know of). Thanks!